Visit one of the worlds oldest botanical gardens (1683) while you’re in Amsterdam. Close to the heart of Amsterdam lies the Hortus Botanicus, a beautiful green jungle in the middle of the Netherlands capitol. The Hortus has an outdoor garden with a bamboo path, ponds, beautiful old trees, rare plants, flowers and more. There are several greenhouses with different themes: desert region, subtropics and tropics and a butterfly glass house. In the museum cafe you can get a good cup of coffee, tea, delicious pastry or an organic lunch. Enojy a peaceful walk in Amsterdams green botanical garden. Perfect to do when it rains, with your family or for a romantic afternoon. There are free maps available in the garden and also free maps with special walk routes. For children they have a child program and if wanted guided tours (pay a small fee). The botanical garden is opened throughout the whole year! The entrance fee is just 4,50 for children and 8,50 for adults. 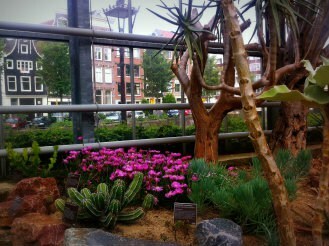 The Hortus is located near the Artis Zoo and the Jewish History Museum. Click here for more information and the Hortus website.